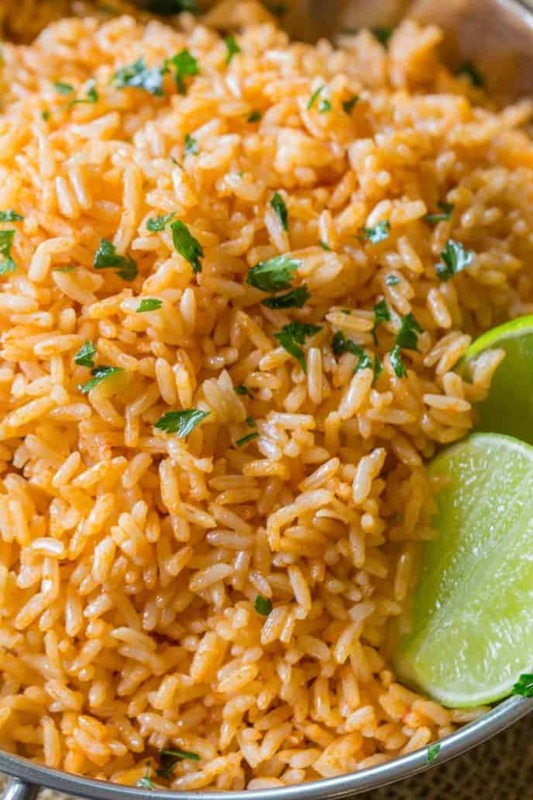 Easy Spanish Rice, also called Mexican Rice, that tastes just like your favorite restaurant side dish with with an easy trick for perfectly fluffy rice! 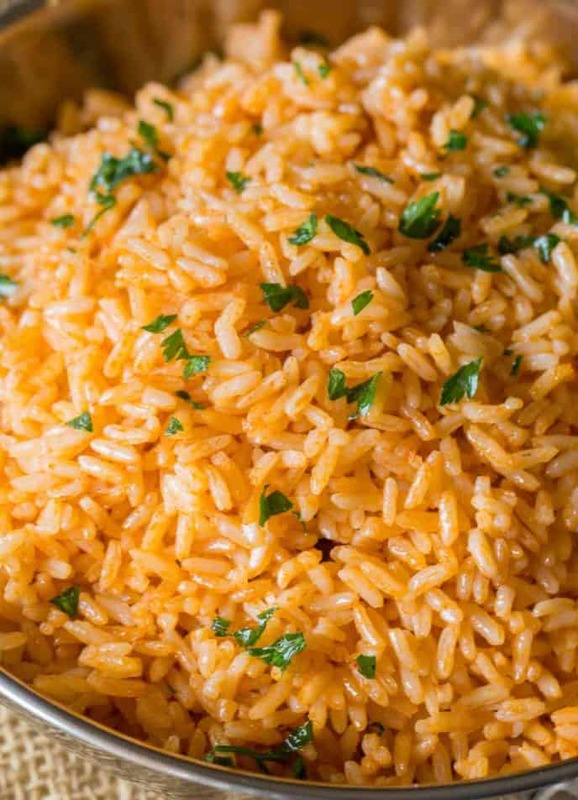 Spanish Rice is a classic dish sometimes also referred to as red rice (arroz rojo). 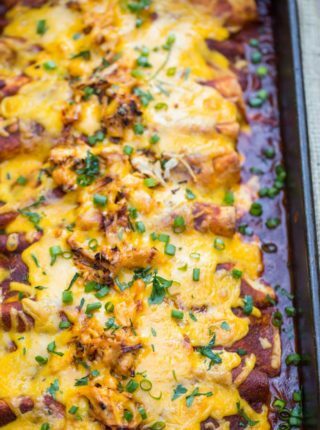 We love these classic base recipes like Enchilada Sauce and Homemade Taco Seasoning because they make quick dinners a breeze! My favorite thing about going to Mexican restaurants is the rice. I’ve even just ordered a plate of red rice and green rice and enjoyed it with a bunch of salsa and chips. I’m pretty easy to please when it comes to piles of rice. First, please toast the rice in canola oil until it is translucent. By translucent I just mean it isn’t as white as it started. You won’t be able to see through the rice, but it will look kind of like foggy clear plastic. Second, bring your rice to a rolling boil before lowering it to a simmer. If you add the liquids and immediately lower the heat you will not have rice that is done in 20 minutes. It will be almost raw. Third, make sure you don’t open the lid during cooking. When you open the lid of the rice all the steam that is so important to the cooking escapes. This means you will have to cook longer, won’t have enough liquid in it and will have unevenly cooked rice. Let your Rice REST. Once you turn off the heat after 20 minutes, leave the cover on for an additional five minutes. Then open the lid and rake the rice with a fork to fluff it up before serving. Follow those rules of rice and I promise you’re going to be happy. 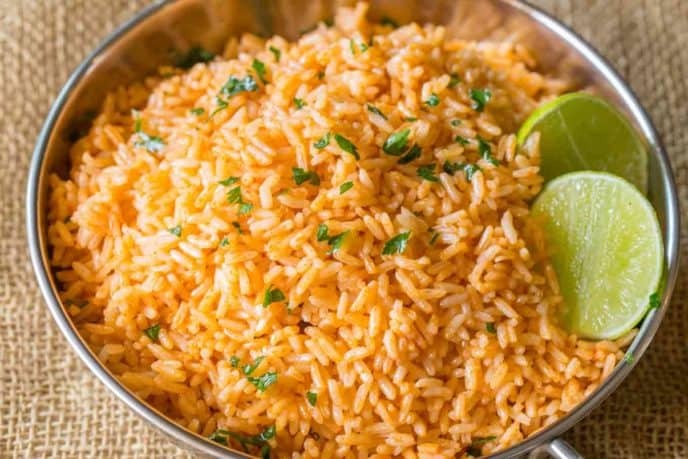 This recipe is an easy classic, basic Mexican rice recipe. There are TONS of ways you can add flair and different flavors to this recipe to make it a bit more substantial too. Tomato: Fresh diced tomatoes or even canned diced tomatoes are a great addition to the recipe and add lots of flavor. 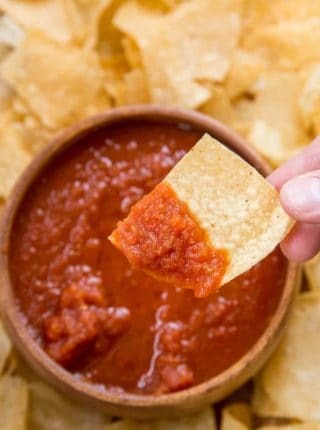 Salsa: Salsa adds a ton of flavor. Add a cup of salsa and pull back on the chicken broth to just a cup. Taco Seasoning: Skip the seasonings here and add a tablespoon and a half of taco seasoning. Onion: 1 finely diced onion cooked for 5-6 minutes in a bit of canola oil before adding the rice to toast is a great flavor enhancer. Lime Juice/Lime Zest: I add this at the end for a splash of fresh flavors. Cilantro: Great as a garnish but I also sometimes cook with the cilantro as well. Why is my Spanish Rice Sticky? If you don’t take the time to cook the rice in oil until translucent you’ll have the starch that is coating the rice create a sticky texture instead of a fluffy one. Why is my Spanish Rice Mushy? Well aside from not cooking in oil to prevent the starch from creating a sticky texture, if your rice is mushy you likely overcooked the rice. Why is the bottom of the rice burnt? If you cooked on a temperature that is too high (you should always bring to a boil before reducing to a simmer) then the rice will be burnt on the bottom and raw on top. 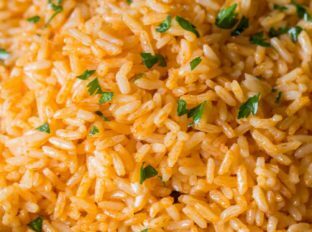 What kind of rice is best for Spanish Rice: I use long grain rice but you can also use basmati rice. Basmati rice won’t be quite as fluffy as the grain isn’t as wide. You can also swap brown rice as the flavors will help mask the traditional brown rice flavors kids don’t like, but remember brown rice takes longer to cook than white rice. What to serve with Spanish Rice? 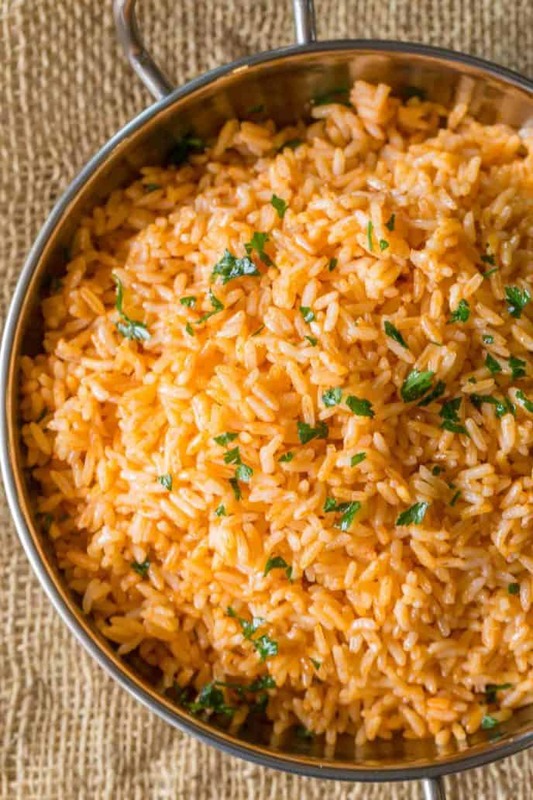 Classic recipes like tamales, burritos, quesadillas, taquitos, chimichangas, fajitas and more are obvious options that would pair well with this rice. Easy Spanish Rice, sometimes called Mexican Rice that takes no time at all and tastes just like your favorite Mexican restaurant with an easy trick for perfectly fluffy rice! Add the canola oil and rice in a dutch oven on medium high heat, stirring until translucent (less white, more see-through-ish), about 3-4 minutes. Add in the broth, tomato sauce, chili powder, cumin and garlic salt. Bring to a boil, then lower the heat to simmer. Cover, cooking 20 minutes then letting rest an additional five minutes before fluffing. I’m trying really hard to get away from processed foods. I did a search for Spanish Rice, and yours looked the best! I had a little salsa and some cooked black beans left over so I added them. I just dumped everything into the rice cooker. I hope it turns out- it’s smelling heavenly! I have been trying to make this rice for years and never have been able to get it right. It sticks to the pan, it’s undercooked or it’s over cooked, mushy or just taste awful. Your tips and add ins were a huge help! And it turned out perfectly. Thank you! So happy to hear, Ashley! Followed instructions, after 20 uncooked rice and most of the tomato sauce was floating on the top…what did I do wrong. Had it on simmer. Sounds like maybe it didn’t come to a rolling boil before turning it down to simmer. The rice tastes pretty good, but did not look anything like you’re photo. I think 15oz of tomato sauce is too much. My rice was red!!! And it wasn’t fluffy all. I did cook the rice in the oil for 5 minutes and it looked right. Lost the white color etc. Followed the rest of the directions to a T, but the rice was still kind of sticky. Disappointed with that. I will keep searching and trying for the perfect recipe. My experience was the same as Cheryl’s. Way tomato-ey in taste and color and the rice was a bit sticky. Ended up tasting good, but not the color or texture I was hoping for. Same here. My rice was way too red and tomato-y. I may add more chicken stock and less tomato sauce next time. Rice was a great texture though. This is good for flavor, but needs 1/4 C less water for basmati rice. Ok for standard long grain. Just used this recipe for the 1st time and I must say it is delicious for such simple ingredients! Thanks for sharing! You’re welcome, Tracy! Thanks for the 5 star rating! This recipe is good, but not very clear. boil when? In the oil? That’s what it states. 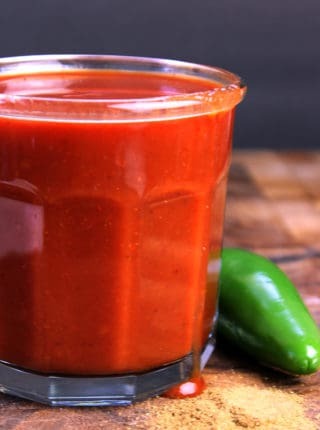 I added a small can of el pato hot sauce, 10oz of Mateo’s mild salsa, and chicken stock then brought that to a boil for a little while, then turned it down to a simmer. Added cilantro and lime at the end. Da Bomb!!! Oh no, it looks like one of the line instructions was flip flopped. Thanks for catchin that. I’ve updated to read correctly now. Thanks for the suggestion Daniela! 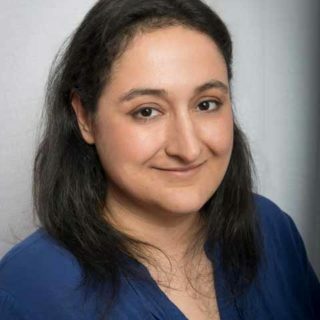 Thank you for the tip Daniela!! Was craving some Mexican food and whipped this up with the onion, cilantro, tomato, and lemon (instead of lime) juice add-ins. Super fast and yummy. Will make again. Delicious! This is perfect for tacos! My family LOVES Spanish Rice! I can’t wait to give this recipe a try! I want to try this, but I don’t understand….are we adding water to this as well per the rice instructions??? What are we bringing to a boil? Are we supposed to cook in oil, then water then add recipe ingredients?? You toast the rice until it is translucent then add in the rest of the ingredients. Bring the pot to a boil then reduce to a simmer, cover and cook for the remaining about of time. You will not be adding water, the broth is a replacement for the water in this recipe. Thanks for this reply, I didn’t understand the instructions on that part either. Looking forward to trying this! agree, the instructions need to be updated. Says bring to a rolling boil and then add in the broth, etc. Haven’t made it yet, came back to figure out what the instructions meant with the rolling boil before adding any liquid. maybe you need to learn how to cook basic rice first, because her instructions are really clear, unless you have never cooked rice before. I was confused too. So…cook rice in canola oil til translucent then add the broth, tom sauce, and seasoning and then simmer 20 minutes? Sorry about that. I’ve updated to read correctly now. Delicious! 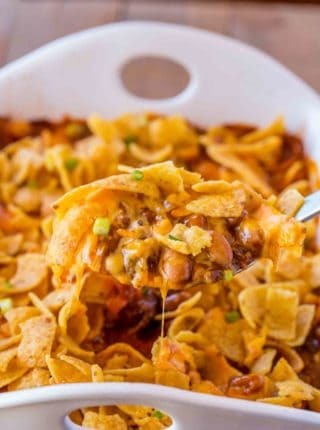 Perfect for taco night! Love this recipe! We use it in burritos too! I’m loving the ingredient lineup in this recipe! It looks so yummy and flavorful! A perfect side dish for most any meal! This looks perfect and makes such a great side dish!